The violence in Africa's newest country has created the continent's largest displacement crisis, and as thousands of South Sudanese refugees continue to pour into neighboring countries to escape attacks from armed groups, the U.N. refugee agency is sounding an alarm. "We now have 1.5 million refugees that have fled South Sudan ... 60 percent of them children ... with this, now, South Sudan becomes Africa's largest refugee-producing country and third largest after Syria and Afghanistan," Babar Baloch, a spokesman for the officer of the U.N. High Commissioner for Refugees, told VOA from Geneva. Uganda is the largest recipient of South Sudanese refugees. "Around 700,000 have fled to Uganda," Baloch said. "Others have gone to Sudan, Ethiopia, DRC and Central African Republic as well. And what we have seen is all these communities in the neighboring countries who are welcoming the South Sudanese refugees, they don't have enough themselves." Refugee Sidah Hawa, who recently arrived with her six children in Kuluba, a small town in northern Uganda, said she "had just planted some crops and I was waiting to harvest. I lost everything because of the war. They are killing people." Raimon Towongo barely escaped his hometown on an old bicycle. He lost everything when his village was attacked. "Look at me. I am wearing torn, dirty clothes. We sleep in the bush. This is a terrible situation," he said. FILE - A woman from South Sudan stands in front of a UNHCR passenger bus next to a refugee registration site near Bibi Bidi, Uganda, Dec. 11, 2016. Hawa and Towongo are among the thousands of refugees who have streamed into Uganda since intense fighting broke out in July, following the collapse of a peace deal between the government and opposition forces. With hostilities now entering a fourth year, Brian Adeba, associate director for policy at the Enough Project, a Washington nonprofit focused on ending genocide and crimes against humanity, said it's time to focus on the root causes of the conflict. "These charades that are taking place — like the national dialogue, which is not inclusive; the statements by JMEC, the organization that is supposed to oversee this peace agreement, the statements that allude to the fact that everything is moving on smoothly — this is just a phantom process, and we need to recognize the peace deal for what it is: It is dead," Adeba said. All the parties involved need to return to the negotiating table, he said. "The government is a key actor in this conflict [and] needs to be at the table," Adeba said. "The SPLM-IO in opposition, led by Riek Machar, has to be at the negotiating table as well, but we also have to be cognizant of the armed groups that have come up. There are several of them in the Equatorias and in the Upper Nile that need to be brought to the table." The Joint Monitoring and Evaluation Commission (JMEC) condemned the violence in South Sudan and called for the parties involved "to cease all military activity." FILE - Government soldiers follow orders to raise their guns during a military parade in Juba, South Sudan, April 14, 2016. Speaking at a JMEC meeting in South Sudan's capital, Juba, on February 8, Chairman Festus Mogae, the former president of Botswana, said he was "dismayed at the continuing conflict in Equatoria and the appalling outbreak of the violence in Wau and Upper Nile over the past two weeks." He demanded unfettered humanitarian access and highlighted reports of torture, sexual violence and other human rights abuses in parts of the country. To bolster security in Juba and its surroundings, Mogae appealed for the urgent deployment of a 4,000-member regional protection force as approved by the U.N. Security Council. 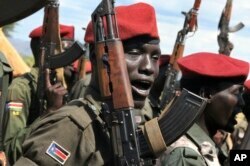 "President Salva Kiir has made a commitment to end the violence and bring about peace, yet we still see ongoing clashes, and the risk that mass atrocities will be committed remains ever present," Adama Dieng, the U.N. special adviser on genocide prevention, warned last week. Dieng said he was particularly alarmed at the situation in Kajo-Keji, where fleeing civilians have said they fear mass violence. The latest influx of refugees is straining the capacity of transit and reception centers in neighboring countries. Agencies are appealing for more donor funds. In 2016, Baloch said, the UNHCR "only got 33 percent of the funding needed to deal with the refugee crisis. The horrifying tales that are being shared by the refugees who have lost so much are a reminder of how brutal this war has been, and of the need for more help from the international community." The total revised 2017 requirements for the South Sudan situation, including additional requirements, now amount to $781.8 million. FILE - Refugees who fled the recent violence in South Sudan and crossed the border into Uganda carry their belongings as they await transportation from a transit center in the town of Koboko to a nearby settlement in Arua District, in northern Uganda, Jan. 6, 2014. "It costs almost $10 million to host 10,000 refugees, and we have 4,000 crossing every day. That means in three days we have a need to raise almost $10 million to help them out," Ajit Fernando, UNHCR deputy representative, said at a meeting Tuesday in Kampala with U.S. Ambassador to Uganda Deborah Malac. In response to UNHCR's 2017 supplementary appeal, Malac announced the U.S. government would give an additional $25 million to help Ugandan authorities deal with the South Sudan refugee crisis.